This morning, The New Yorker heralded the arrival of Speculative 9/11 Fiction with trepidation, calling the trend “unsettling.” The article is partly a commentary on how fiction of any kind deals with traumatic, culture-shaping events, and partly a review of the new anthology In the Shadow of the Towers: Speculative Fiction in a Post-9/11 World (edited by Douglas Lain). In it, Joshua Rothman talks about how we’ve arrived at a “a transition in the legacy of 9/11.” It’s no longer Too Soon, and soon the 9/11 video games and romance novels will roll in. I think we passed the Too Soon point long ago; but, even if we hadn’t, science fiction and fantasy writers have always been quicker to start the cultural processing of traumatic events because we can couch them, parable-like, in worlds and times far away from our own. Hell, Richard Bowes’ “There’s a Hole in the City” was published just four years post 9/11. That’s not to say speculative fiction about a traumatic event can’t still be upsetting to read, even fully divorced from the actual event as my own story, “Until Forgiveness Comes,” is. Because fiction comes from the same place as memory and emotion. The best SF stories are often about working through trauma and deep emotion, drawing on the deep wells within their authors—even when they’re not strictly biographical. The stories in this week’s roundup are like that. They’re not about 9/11, but they are about loss, desperation, processing, and coming out on the other side... or not. My sister won’t believe me. “Why would I want to look at your dead skin.” She pushes my hand away. “Ida, just look, just, just look.” The fragment is delicate, draped across my fingertip. “Look at it this way.” I twist so the text runs left-to-right under her eyes. We’re sitting at the edge of the basketball court that centers the spokes of our apartment complex. A grey squirrel, still as the grave, sits like another spectator five feet away. Its flat, dark eyes are on us. “I’m not doing it.” I shoulder closer, push the fragment closer to her face so she’ll really see. Ida leans away and throws her palms up between us. “What’s up, Bon-ton,” he says. Papa called me that. Will’s huffing air hard. I don’t show him the skin. I look hard in the mirror that night, but the words aren’t there before the skin peels off. It isn’t there if it peels off on its own, either. I have to pull it, and then the words come. I pull off the edge of my collarbone and it says ipped and grieving. Just below that, two fragments come off to make the phrase peaks like wisps. The thing that struck me about this story as I listened to the podcast is how deft Reed is at creating gorgeous word pictures. Every evocation is spot on, not too purple, but poetic in a way that allows you to see the image in your mind even if it’s not the exact image she saw in hers. When paired with a character and a narrative that are both engaging and heartbreaking, you get a story of sublime beauty. Highly Recommended. The main character’s desperation pours out of this story. And while that’s not an emotion I want to swim in forever, it’s one that many people can empathize with, even as they back away from how much it resonates with moments of their own lives. With this story, Samatar plucks at the secret thoughts and desires we all harbor, lays it out on the page with a fictional person, then gives you the choice of whether to engage or not. He nods thoughtfully. For a moment he’s somewhere else, his eyes focusing on a distant point of tomorrow’s calendars. “I want to be an astronaut,” he says suddenly. It’s the first conversation we’ve ever had about what he might want to be. Sammy is seven years old. As far as I know, he still thinks summer vacations last an entire year. The other week one of the commenters quibbled with the use of “speculative fiction” as a term for science fiction. I still maintain that spec fic is a perfectly good umbrella term for SF, F, & H and that no, all fiction isn’t “speculative”. However, if any story deserves the term applied to it, it’s this one. Is it actually science fiction, or is it spec fic? Either way, I found it touching and saddening in equal measure. 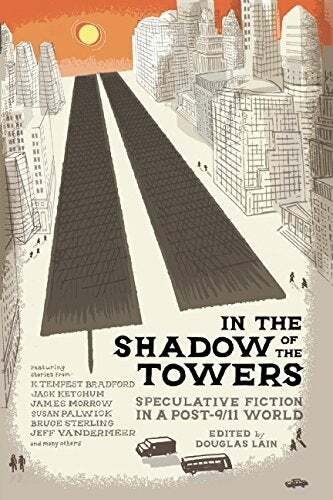 K. Tempest Bradford is a speculative fiction author, media critic, issuer of the Tempest Challenge, and author of “Until Forgiveness Comes,” reprinted in In the Shadow of the Towers: Speculative Fiction in a Post-9/11 World. Follow her on Twitter, G+, Tumblr, or her blog.